Offering “oodles” of storage to accommodate almost any sized website, some people might think that FatCow doesn’t mean business when it comes to webhosting. 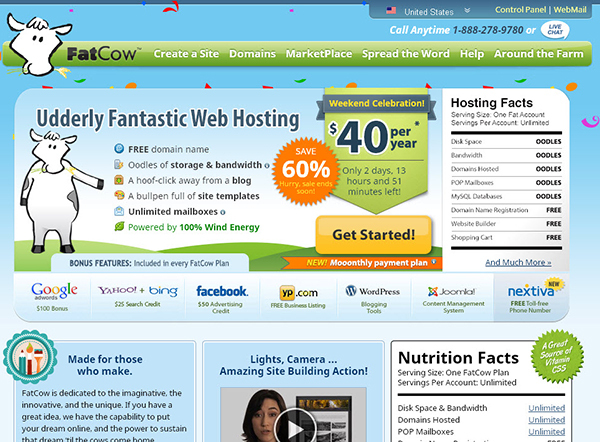 But with its low $3.33/month rate, FatCow proves its dedication to bringing fun, full-featured webhosting to the people. To that end, FatCow gives you one of the easiest point-and-click site builders in the industry, employing attractive themes and templates to get your site up and running quickly. For people trying to open an eCommerce website, you’ll find tons of shopping cart options, as well as PayPal integration and several promotional tools. So that you never get lost, FatCow’s Moo Crew is available for 24/7 support by phone, email or chat. For the full stampede of “udderly fantastic” services that FatCow has rounded up, visit FatCow today! Featuring Weebly’s infamously easy site builder, you’ll have access to simple drag-and-drop tools to design the page you’ve been dreaming of. Using straightforward themes and templates, most of the serious design work will already be done, and you can just drop in images and custom text as you see fit. If you’re more of a hands-on webmaster, you can build your site with FatCow’s vDeck control panel, which offers 1-click installations of several of the web’s most popular apps. Email setup is also a 1-step process, simply asking you to choose an address and password for your domain to begin accepting and sending emails. To help you craft your personalized website, FatCow gives you a free year of domain name registry, as well as its handy template-based web building interface to get you online quickly. With “oodles” of storage for your webpage, you shouldn’t ever have to worry about how much data your site uses. You’ll also get unlimited bandwidth, meaning that you don’t have to worry about how many people visit your page. FatCow also gives you tons of options in terms of your website’s capabilities, particularly with access to scripts for some of the most powerful and popular website plugins around, like WordPress, Gallery2, phpBB, GBook and Joomla. If you’d really like to get down to the nitty-gritty, though, FatCow offers tons of programming support as well. You can code your website using PHP, Perl or Ruby, while also receiving great CGI support from FatCow. No matter what level of experience you have with website building, it seems that FatCow is prepared to accommodate you. Many people online want to build an eCommerce store, and they’ll certainly find a plethora of support on FatCow. Beginning with a ShopSite online store, you’ll be able to set up your products in a convenient way for your customers to peruse. You can also accept credit cards right off the bat, or set up a PayPal interface to take advantage of the most popular online payment service. To protect your customers, you’ll also have a shared SSL, which basically encrypts your customers’ sensitive information. FatCow also makes it easy to cultivate interest and awareness of your website with advertising credits included in your account. Even with FatCow’s most basic plan, you’ll receive $175 in advertising credits, including a $100 Google AdWords credit, which could help you get noticed on the most popular site on the internet. To make sure that you always feel like a part of the heard, FatCow provides 24/7 customer service by phone, chat and email. In other words, you’ll be able to consistently receive help whenever you need it from FatCow’s trained and courteous staff. In particular, the company’s chat service is incredibly helpful and responsive, even taking the time to email you a transcription of your conversation so that you won’t have to take notes. You can also learn at your own speed with FatCow’s helpful knowledge base, featuring articles on both complex and simple webhosting procedures. FatCow also offers a user guide page that goes over some fundamental webhosting concepts, which can really lend a hand to newcomers. For most people, the Original FatCow plan will probably offer more than enough power to host and grow their websites. And at a cost of $3.33/month, it’s a hard plan to beat considering the features. Businesses that need their own servers, however, know that a virtual or physical server to transmit your website can result in amazing reliability and uptime. Starting at $19.99/month, you can receive VPS services, which dedicate a specific amount of server space to your website at all times. Dedicated servers, on the other hand, will designate an entire server to your site for the ultimate in uptime, starting at $119.99/month. With amusingly silly puns littered all over its website, FatCow has created an approachable environment to make webhosting fun and accessible for everyone. Despite the unassuming air, though, FatCow has a lot of features that veteran webhosts will really appreciate. Giving you the option of how you want to design your website, you can start from the ground up, or simply plug in the features that you want. And, with unlimited storage and band width, you won’t have to constantly worry about how much data your site uses or how many visitors you’re receiving. With FatCow, all you’ll really have to worry about is bringing your vision to the World Wide Web, which is a welcome change of pace.